The lost village of Horsepool. Somewhere in the parish of Thurgarton is the lost village of Horsepool. The Victoria County History of Nottinghamshire claimed that it lay 1 mile to the north of Thurgarton village but other evidence points firmly to the south of the parish close to the River Trent (1) . The earliest mention of Horsepool in Domesday includes it within the vill of Thurgarton but provides no clue to its size or location. The main written source for Horsepool can be found in the Register or Cartulary of Thurgarton Priory where several charters of land grants in Horsepool are recorded from the 12th and 13th centuries (2) . These charters include many of the field names of Horsepool some of which survived into 18th century parish surveys and maps. One such field, Dunsbriggefurlong, lay in the south-western corner of the parish next to Hoveringham. The fields of Horsepool appear to have occupied the southern part of modern Thurgarton parish and lay between Hoveringham and Gibsmere. Fig 1 Fields of Horsepool in south of Thurgarton parish (white) - Thurgarton village – green, Horsepool fields -blue, old road -red. One of the Horsepool charters refers to a toft (cottage) and the wall of a grange which were located close to ‘the king’s highway’ (4). The king’s way referred to is the bridle road which was one of the main routes from Nottingham to Newark. 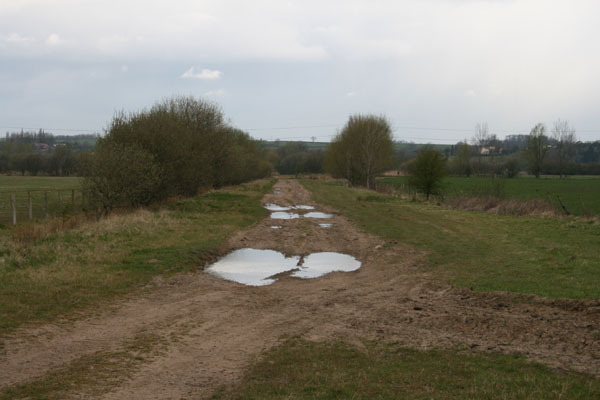 The road appears on all the early parish maps and ran from Hoveringham Mill ( here it was called Milngate) across the southernmost fields of Thurgarton parish and onto Gibsmere and the Trent crossing at Hazelford. Horsepool evidently lay alongside this road most of which is now merely a footpath but parts of the original wide trackway survive. In 1328 a survey of the lands of Thurgarton Priory mentions John Criol’s hall in Horsepool; Hall field was a large field which bordered Hoveringham and the name suggests this may have been the site of his hall. The Criols (or Kiriolls) appear to have been the main landowners in Horsepool; initially they were probably subtenants of the Dayncourt barons who were Lords of the Manor of Thurgarton but by the 14th century much of Horsepool belonged to Thurgarton Priory to which the Criols made several gifts of land (5). The Horsepool charters refer to cottages, gardens, a barn and closes but only seven householders were identified in the the 1328 survey of Thurgarton Priory (compared with over 60 householders in Thurgarton), suggesting that Horsepool was a small community. One can picture a hamlet close to the Criol’s hall or grange lying alongside the old road – in character and size somewhat similar to its near neighbour, Gibsmere, in Bleasby parish. Sadly any vestige of Horsepool’s cottages, walls or hall has been obliterated by extensive gravel extracton in the 1950-60s; every field in the parish south of the railway line was excavated. Some aerial photos however were taken before the gravel extraction; in figure 3 below, a possible trackway surrounded by humps and cropmarks can be seen with the eye of faith in the field adjacent to Coneygree farm. 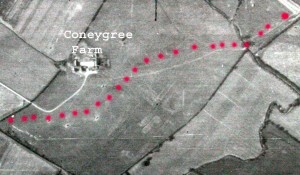 Fig 3 Aerial photo 1948 showing Coneygree farm and with possible trackway (red dots), cropmarks and humps in field (6). In 1949 these features came to the attention of local archaeologists. They reported a sunken trackway next to several humps some nearly 30 ft across; excavation of one of these humps revealed a scatter of skerry stone and mediaeval pottery. Although no definite remains of houses etc were uncovered they concluded with suprising confidence that ‘ these humps are the remains of the long lost village of Horspol’ (7). Their OS grid reference for this site places it just south-east of Coneygree Farm. In 1961 close to the above location an old well and further mediaeval pottery were uncovered. All of this site was subject to gravel extraction – if this was Horsepool it now lies 40ft down. Deserted Mediaeval Villages (DMVs) hold an especial interest for local historians who popularised this area of study 60 years ago. The list of such deserted sites has increased to many thousands and they raise the obvious question as to why such villages disappeared from the landscape; their study however has revealed not only why villages died but also how they were born, grew, shrank and shifted in the landscape (8). There is no single cause for the death of these villages. The Black Death would undoubtedly have depopulated most communities and rendered some nonviable but many survived this catastrophe; some succumbed to land enclosure, others disappeared in the planning of new country houses and parkland, some were swallowed up in industrial expansion, new reservoirs, natural disasters etc- the list of causes is a long one (9). Horsepool certainly survived the Black Death. The last reference to Horsepool Grange is in 1539 on the sale of Thurgarton Priory land to William Cooper. Later surveys of Thurgarton merely refer to the fields of Horsepool and no mention is made of tofts, barns or hall. The grounds of Horsepool are recorded in the 1730 survey and map of Trinity College estate in Thurgarton. 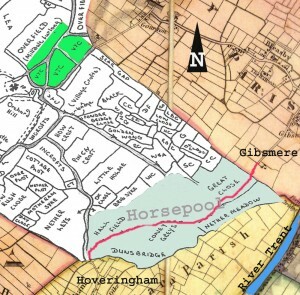 ; they lie just across the border in Gibsmere close to Glebe Farm, which has recently been renamed Horsepool Grange. Horsepool’s demise seems to date to the 16th or 17th century but the estate records give no indication of exactly when and why it disappeared. It was owned by Trinity College Cambridge who leased their lands to several generations of the local squires – the Cooper family. Estate improvement with enclosure is a possibility but so is repeated flooding from the Trent – we can only speculate. The mediaeval charters and surveys name several of the Horsepool folk – Margery the widow of William Frauncey, Thomas the Pinder, Richard Petrich, Richard Willan, Wiiliam Asger and several generations of Criols. 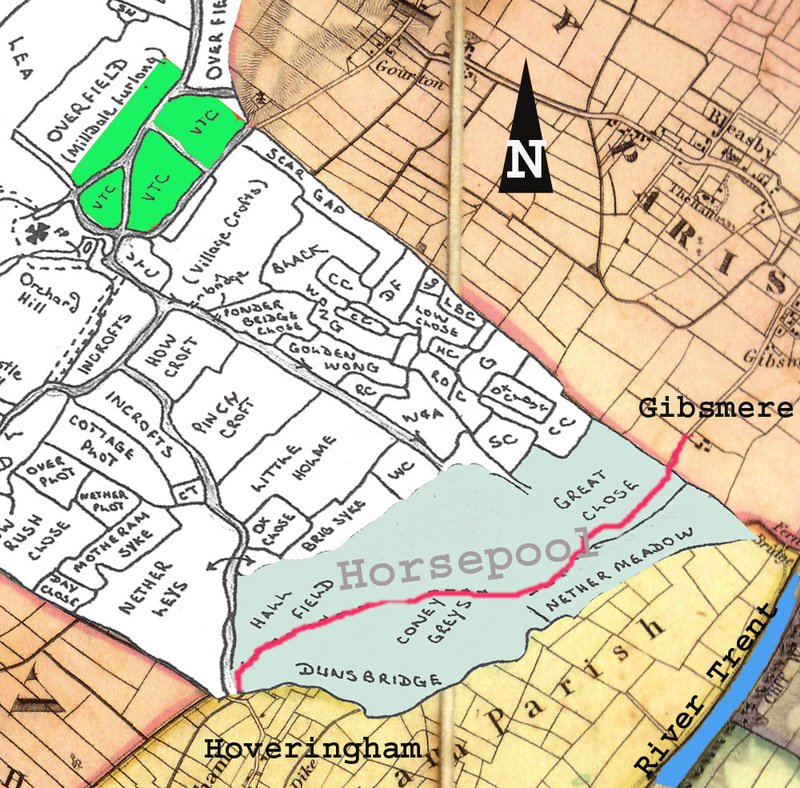 Some would have adopted the name Horsepool as their family name – a not uncommon surname in this area. 7 H.O. Houldsworth, Peveril Archaeology Group, Annual Report 1949. pp.11-2. This entry was posted in Uncategorized by ellis_admin. Bookmark the permalink. I found this very informative and interesting.I had heard about the lost village but never really known where it was situated.